Description: The flower has five small, thick sepals at the base of five pale yellow petals each about a centimeter long. The plant is a fleshy perennial forming a small basal cluster of leaves around a central thickened, short, perennial stem. Leaf: The thick, waxy leaves are triangular to oblong and usually pointed formed in a basal rosette, reaching up to 11 centimeters in length, but often remaining much smaller. The type population of subsp. affinis is notable for its solitary, small rosettes of leaves wide for their length. Range: San Bernardino Mountains, sw edge Mojave Desert. 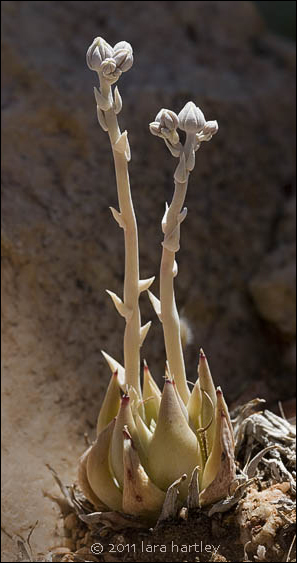 Notes: Dudleya abramsii ssp. affinis, a dicot, is a perennial herb that is native to California and is endemic (limited) to California alone. 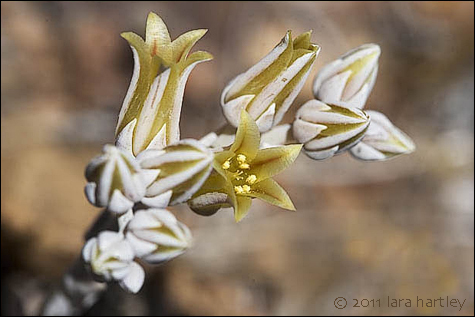 It is included in the CNPS Inventory of Rare and Endangered Plants on list 1B.2, rare, threatened, or endangered. Photographed at Cactus Flat, Pebble Plain, San Bernardino Mountains, San Bernardino County, California using a Canon EOS 20D and a 100mm macro lens.